hi there. so great to hear from all of you about the simple things you are enjoying this week. keep ’em coming! today, a photo from a quiet breakfast & coffee taken outdoors this morning. what a nice way to start a day. and a link – ma fleure, music from the cinematic orchestra. you can stream each song there (be sure to listen to the track ‘to build a home’) and you can also download the entire thing on emusic (and probably itunes, too). it’s transporting music to play in the background as you go about your day. Breakfast enjoyed out of doors… ah yes, what could be sweeter? Little, I wager, very little. Such a pleasant start to the day. my favorite way to start the day. thanks for the link too. Outdoor breakfast & coffee sounds lovely! I wish I had a place for that around where I live..
okay, i’m setting up my chairs and table outside right now. 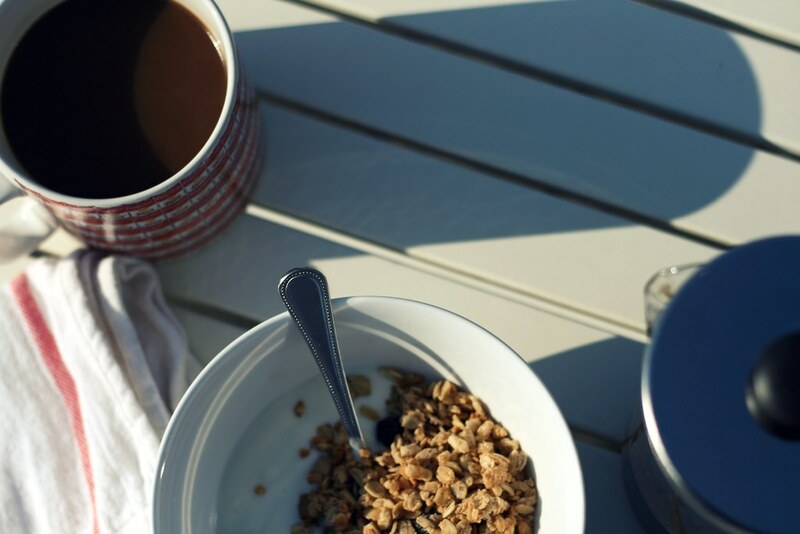 breakfast outside sounds like the best way to start the day!! this picture is great–and embodies one of my favorite simple things: time in the morning to enjoy the quiet (or the birds, now that it’s summer), the sunshine and my coffee before the day gets crazy. I adore drinking coffee outside and of course listening to music makes it all sooo much better. Ah, the peace. Breakfast at our house is usually pre-dawn and involves tall cereal boxes lined up across the center of the table to keep the opposing sides from starting a war before we make it to school. Hi, leaving a note to say i just discovered your blog through Simply Photo and i am hooked!